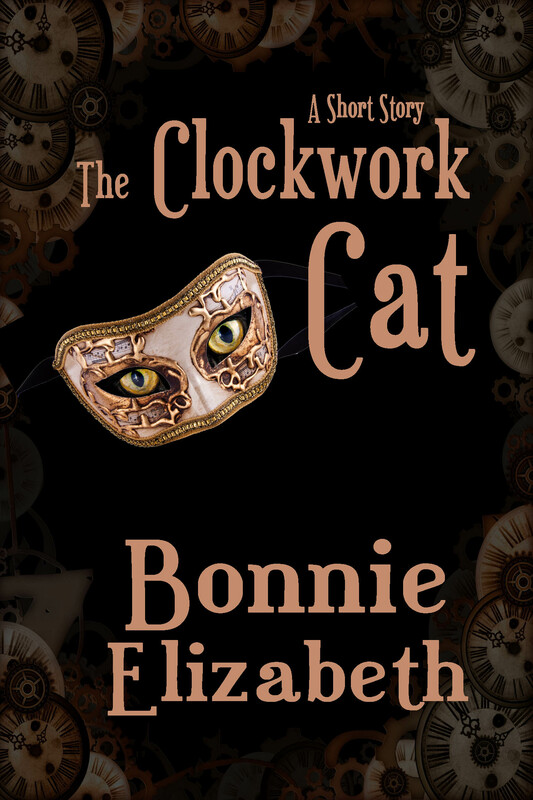 “The Clockwork Cat” is a copyrighted work of fiction by Bonnie Elizabeth. It is not available for sale as a short story, although it is available in Stories from 2017. The clockwork cat should never have caught the spy mouse, but it did. And Praline should never have built the clockwork cat, but she had. Praline didn’t like to think that she’d broken rules, so she didn’t. Soon enough, she’d be reaping the harvest of her thoughtless tinkering. Praline worked in her small library, amid books that had dark leather and thick spines. There were other more colorful books that were hers. The dark leather books were overflow books owned by her father, just like Praline’s small library was an overflow place for many things. There was an old blackened steamer trunk under the tall mullioned window, filled with out of date fashions of her mother’s. The two tables that held flowers had been moved because of scratches to the bases. No doubt the scratches were put there by Praline and her brother when they were children. Still, Praline liked it because it was her sanctum. Praline ignored her cane and limped over to the table where her special chair, so large and comfortable, designed for her body with a special foot rest on the left side for her short and twisted leg. She settled in, pulling it against the large wooden table that sat near the corner of her library. Around her, sat open books on steam engineering and boxes of gears and small tools. The flowers that Maddie, the housekeeper, had arranged on the tables smelled cloying and Praline hoped that they’d die soon enough. Each day as they began to open and then wilt the smell became stronger and she was becoming tired of it. The clockwork cat waited on the table. Its mouth opened and closed with a clicking noise that was as close at it could come to a meow. Praline hadn’t expected that it could move. She had hoped she could create a pretty little creature that would keep her company and maybe make a sound, but somehow she’d created this cat. “Talent,” her brother had said the other night. Her father looked disapproving. “Girls don’t have talent like that.” And that was that. Praline’s mother had fanned herself a little but said nothing. She hadn’t come to the library, hadn’t looked at the clockwork cat. She said she couldn’t abide clockwork animals. It was startling because she was a woman who rarely objected to anything, particularly not something her child had done. The clockwork cat was not mentioned by her family again, although Praline continued to let it run around her library. Her brother did whatever it was brothers did to run the plantation and her father worked from his own office. Maddie was really the only one who ever joined Praline in the library, but she was there to dust and clean and make sure Praline remembered to eat. “That cat not goin’ do you no good,” Maddie said only yesterday. “This cat doesn’t make a mess or cause Jonas to sneeze,” Praline replied calmly. She continued to tinker. “Your mama don’t like that clockwork cat,” Maddie continued. She swiped at a cobweb. “Do you think it strange that Mama actually said she didn’t like something?” Praline asked. She looked up at Maddie. Praline waited. She’d known Maddie all her life. Maddie had been there to snuggle her as a child when her mother didn’t. Maddie, for all intents and purposes had raised her. If Praline were asked about her family, she’d have listed her parents and brother. But if asked who she loved most, Maddie’s face first came to mind, not that she’d ever say it. She had once, when she was a child and that hadn’t gone over well at all. “Your grandmamma came over here with your grandfather because they didn’t want to be bothered by the steam wizards. Rumors always tell that those who didn’t come for the tobacco and the land was that they had talent and were in trouble with the wizards,” Maddie said quietly. She moved to the table, her feather duster hanging down, not moving, an usual thing to see. “I think you got steam magic in you even if you is a girl child. Maybe it’s that messed up leg, but you can make those things move. Could be why you weren’t interested in those little flying creatures, like the other girls who tinker.” The feather duster had moved again. Praline said nothing. She didn’t think her messed up leg was a part of her ability. After all, her mind was in her head and not in her leg. But Maddie made weird statements sometimes and sometimes those things were true, no matter that they were strange. Maddie went back to her dusting and Praline went back to her tinkering. The clockwork cat watched. He’d come to life only last week as she was putting the finishing touches on him. She’d hoped she had enough gears to make him raise a paw. She’d been thinking about that as she’d started winding up the main mechanism just where his neck would meet his body. She’d been thinking too that she hoped he made her happy the way a real cat would have done. And she’d turned her key around and around, again and again. The cat had looked up and opened its mouth. It was silver all over but she had painted the face in black paint and inside the mouth in pink. Its eyes were green, one a little lower than the other but it gave the cat character. A clicking sound came out, not the meow she’d hoped for. Instead of raising a paw, the clockwork cat had stood up and walked across the table, leaping easily to the floor. It had pranced around exploring the room like a real cat might for the rest of the day, not needing winding again. Praline couldn’t explain it. Girls were not talented. On the Carolina tobacco plantations, it was scandalous enough that girls might tinker at all, much less be talented. Perhaps out west, where they were harnessing the power of the steam under the mountains, a girl could get away with such a thing, but not here. Here a girl was only as valuable as the marriage proposal she brought. Unfortunately for Praline, her twisted leg that gave her a limp, her close-set eyes, and the fact that she would rather read than chat about the latest fashion (the large round full skirts would have her falling out of a chair in an instant), meant she was less than an ideal match as it was. And if she were talented, well, that would be an even bigger problem. For the next few days, Praline had played with her clockwork cat. They’d spent time in the library with it learning to leap on the shelves or to watch the birds and bugs outside the window. In the late afternoon when Maddie would open the large windows it would reach out its paw to attempt and catch the flying creatures that tried to enter the library. Praline giggled each time it tried. The cat became better at its catches. Each night, Praline would settle it into a bed in the library, where the cat would curl, its painted eyes watching the door as she left. Praline had no way of knowing whether the cat stayed in the bed or went wandering, but each morning when she returned it would be there, waiting for her. She would use her key to wind the gears again and the cat would return to what it was doing. One morning, Praline came in and there was a dead mouse on the floor. The next, a dead bird. The clockwork cat was clearly a good hunter. On those days when Praline would come in, the cat would greet her with its clicking mew and wait, raising its head or paw slowly and carefully as it was nearly run down. Finally, this morning, the clockwork cat had captured the spy mouse. It wasn’t laying down in its bed this time, it was sitting on its haunches, waiting, an eagerness in its painted on eyes that Praline couldn’t explain. The clockwork mouse looked ordinary enough. Praline picked it up to examine it. It was plain silver with only the briefest paintings for eyes and whiskers. Whoever had built it was utilitarian. Praline opened the back of the mouse to see if there was a signature. Many people left them. She would return the mouse or have Maddie or one of the other household helpers do it if she couldn’t. There wasn’t a signature, but there was a bit of extra mechanical gear that Praline wasn’t familiar with. She did know enough that this wasn’t an ordinary mouse. Her mouth went dry. She didn’t even wind her clockwork cat before leaving the library to show the mouse to her father. “Where did you get this?” he asked. He was sitting in his office, behind the large desk built of deep dark wood. It was hard and cold to the touch but had sat in that spot for as long as Praline had been alive. The windows were closed for now and so were the deep blue curtains, keeping the morning sun from his back. While he wasn’t smoking, he had done so so often that the room smelled of the musty smoke of his pipe, though the thing sat cold in the tidy blue ashtray where he kept it. “The clockwork cat found it last night. It’s been hunting,” Praline said. She tried to stand as straight as she could while her father watched her. He turned over the spy mouse looking at it. He poked at it with the end of one of his pens. “Send a message that I must see Clarence at once,” he ordered. When Aloysius left the room, Praline’s father set the spy mouse down and looked at her. “I don’t,” Praline said. She hung her head a little. She didn’t want to remind her father that the cat had more energy than a clockwork creature of its size should have. Her father said nothing. He gestured to a chair in the corner, a narrow backed, embroidered thing that was a bit too narrow for Praline to sit comfortably, but she obeyed him. Her back had to be so straight and the edge cut her twisted leg just a bit. Her father, meanwhile, picked up his pipe to smoke. That same smoke was curling out of the room where the doors remained open when Aloysius came back inside. “Clarence has arrived,” he said. He wasn’t sweating. No doubt one of the boys that worked the carriages had been sent out. “Send him in,” Praline’s father said. Aloysius gave Praline a long look but when no one said a thing he turned and left in something of a huff. No doubt, in his eyes, it was unseemly for unmarried daughters to be part of any conversation with two older men. Praline heard Clarence before she saw him. He was tall and broad and the palest man she had ever seen. Even his hair was pale. His eyes were so light they were nearly white. She’d once found him creepy, but he was the one steam wizard her father trusted and she’d come to trust him as well. After ushering him in and settling him into a chair more comfortable than the one Praline was perched upon, Aloysius backed out, closing the doors. He offered Praline one more disapproving look before he did so. “Well?” Clarence asked. He hadn’t even glanced at Praline, but she knew that he was aware of her presence. “Praline has made a clockwork cat,” her father began. Clarence moved, making it clear such news bored him. What other fathers had proudly displayed their children’s work, Praline wondered, to make him so obviously irritated at this interruption of his day. “And the clockwork cat left her this gift this morning,” her father continued, showing the spy mouse. Clarence took the mechanical creature, now broken from the metallic paws and jaw of the clockwork cat and examined it carefully. He pulled out a headset from one of his many pockets and put it on his head, bringing down a single piece of glass that fit over one eye. A metal pick appeared in his hand and he moved a few things here and there. There were a few umm humms… and ahhs while he did so. “It’s a spy mouse,” Clarence said, unnecessarily. “We know that.” Praline’s father looked pained. “Not one of mine,” Clarence said. Praline’s father tugged at his collar uncomfortably. “Can you tell us whose it is?” Praline asked, leaning forward. She knew she wasn’t supposed to talk but she was curious. Who would spy on them? “Why would Lord Hull want to spy on me?” That was from Praline’s father. “Tell me about your clockwork cat that hunts at night,” Clarence turned to ask Praline. Clarence nodded at Praline, making a motion with his hand for her to get to the point. She wasn’t at all sure what he wanted so she kept plunging ahead. Praline made a quick nod before pushing herself off the horrid chair and went quickly to the door. She had barely closed them before she heard the murmur of voices. She wanted to stay and listen to what they were saying but Aloysius was dusting the bannister of the main stairwell, where he could clearly watch what she was up to. Instead Praline hurried off as fast as her twisted leg could carry her to get the clockwork cat. In her library, the cat was laying down in the bed. It tried to raise its head but as Praline hadn’t wound the poor thing that morning it took it as long to raise it halfway up as it did for Praline to cross the room to the corner where she had placed the bed. She took her key and wound the gears. It wouldn’t be good if she brought the cat to Lord Clarence when it wasn’t even running properly. After winding it up, the cat stretched its paws. It wanted to explore, but Praline picked it up, hugging it to her. The edges of the metal were cold and hard against her chest. Still, the clockwork cat turned its head this way and that to get a good look at everything around it. Aloysius was still at the stair, although he was closer to the door than he had been. “I doubt that,” Aloysius said sternly. He hovered, placing himself in between Praline and the door. “Well I have no doubt he would not be pleased to have a child like you running in to a business meeting to show off her toys,” Aloysius said. Praline hurried past Aloysius, trying to keep a look of triumph off her face. The clockwork cat opened its mouth to let out its clicking meow when it was close to Aloysius. Praline’s father closed the door behind them as Praline set the cat on the desk in front of Lord Clarence. The cat turned its head to look at the wizard. It opened its mouth in another of its little clicks. Clarence nodded several times, touching the cat in different places. The cat stood and turned here and there as if someone were playing a strange new game with it. At one point it raised its paw at Clarence as if it was going to attack. “The eyes aren’t quite level,” Praline apologized. Praline smiled at the man. Her father took a puff of his pipe. “I can sense the magic on this. It’s young and quite feminine. I’m reminded of lace and roses when I touch the cat. Do you know why women are not typically steam wizards?” Clarence changed the subject so abruptly that it took both Praline and her father quite by surprise. “But it came so quickly,” Withington said. “I made a few of those little broaches in the last few years. Once I made a small frog which was very fun although it didn’t do much. Not like the cat. I guess looking back on it, the gears in it were too small to have made the creature hop as far as it did but it wasn’t as much of a surprise as the cat. I thought I was just good at the internals of clockworks.” Praline was a little disappointed that she might be doing magic rather than good engineering. Praline looked at her father. “Maybe a year ago now,” he said. “What other options are there?” Withington asked. Clarence stroked his chin for a bit. “Perhaps if I were to live with Maddie’s family off the plantation?” Maddie and her children were free people of color. Maddie worked for Praline’s family as she had all her life but she was not owned. Her family had their own small house and farm in another part of the community. “But you’d stand out. Such things aren’t done,” Withington protested. Clarence nodded, not at all certain where the conversation was headed. “Not likely,” Withington said, smiling, thinking of how little his wife cared for clockwork things. “But she might, might she?” Praline looked at Clarence. Clarence began to see where Praline was going. If the steam lords came and found only Withington’s wife and son and a few of Praline’s small bugs they might be fooled into thinking that she was just beginning to use her magic, in the way of a woman with children no longer in the household. “Then I must die,” Praline said. “You can’t go alone,” Praline’s father said. “Maddie will go with me,” Praline said. “I would join you as well,” Lord Clarence said unexpectedly. Praline looked at him, shocked. “But you’re the only steam lord I trust,” Withington said. Withington looked shocked that things had happened so fast. “Don’t worry, Father. I’ll be okay. Maddie will be there,” Praline said. “I had no idea that you were so talented. I suspected that there was a bit of talent in your mother and perhaps in you as well, but not so much that I’d be forced to let you be sent away. Let me write some letters of introduction. I know people in the west. I shall send some on ahead and you can carry them,” Withington said quietly. His hand shook as he opened the drawer, clearly emotional but unwilling to show it. Praline came as close to dancing as her withered leg allowed. She couldn’t wait to be away from the southern girls and off to the north where everyone with an aptitude for mechanics and engineering and tinkering were welcomed. A place where the steam lords didn’t hold the monopoly on clockwork wizardry. 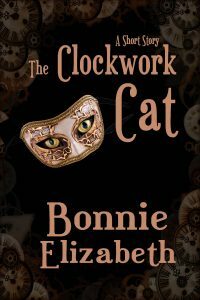 The clockwork cat looked up at her and gave a clicking meow in approval of her thoughts.